To find him smile at me. I met him there – at the day break. And to befriend I tried. To soothe the burning heart. Ugly truth to be curtained down. To see-to catch a fresh glimpse of him. Beautiful and plain; awaiting the trial. For it is her selfdom at stake. Each moment the line receding. Adding to her misery was her brain. Very well to blow the wind. You said blowing-off the wind. Artha Perla is Assistant Professor of English in the Department of Post Graduation Studies in English at Alva’s College, Moodbidri, Karnataka. She is an alumnus of Mangalore University and has a Post Graduate Diploma in English Language Teaching from the Regional Institute of English, Bengaluru. She writes art reviews in regional newspapers and magazines and also has a collection of poetry titled “Nanna Putta Tamma”, in Kannada language to her credit. 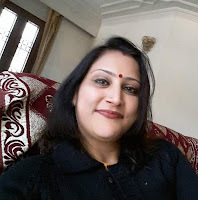 She has presented papers and rendered self-composed poetry in All India Radio, Mangalore and also has the experience of participating at various symposiums. As a Doordarshan (Indian Television) graded classical Bharatanatyam dancer and student of Carnatic Classical music, she is doing her bit in contributing to art, literature and culture.